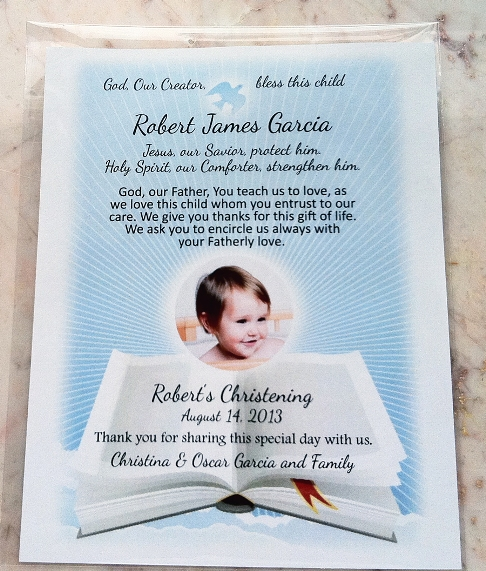 Giving baptism prayer cards is a wonderful way to help guests remember this important event. 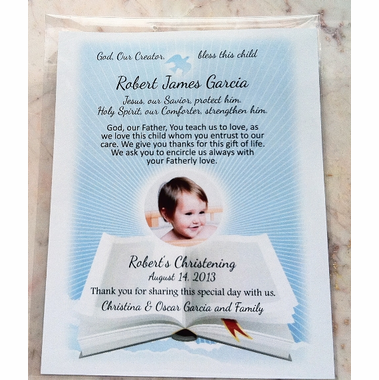 Our personalized remembrance cards are customized with the name of the child and his/her parents, as well as the date of and type of event taking place. Jesus, our Savior, protect him. Holy Spirit, our Comforter, strengthen him. God, our Father, You teach us to love, as we love this child whom you entrust to our care, We give you thanks for this gift of life. We ask you to encircle us always with your Fatherly love. Cards come individually packaged in a clear, sealed pouch measuring approximately 4 1/4"w s 5 3/4"h.
Please email your photo to: Orders@cool-party-favors.com .